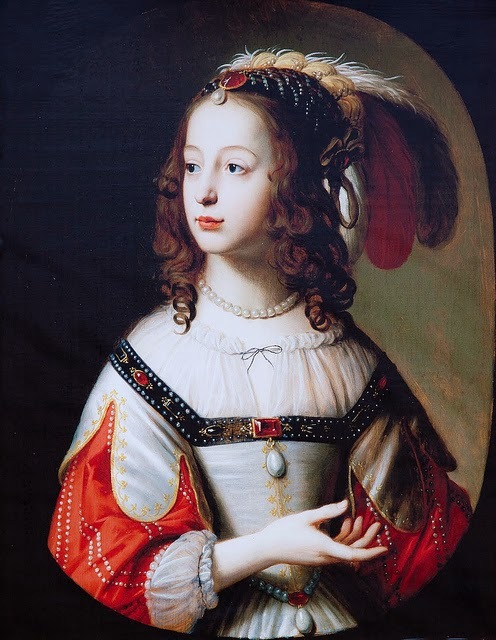 Since her parents had lost the Palatinate during the Thirty Years' War, Sophie was born in the Hague, where her parents had taken refuge. 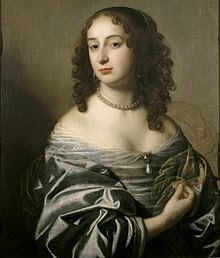 She was married to Ernest Augustus of Brunswick-Lüneburg in 1658; in 1692, he became elector of Hanover, which gave Sophia the name, Sophia of Hanover, by which she is most commonly known. 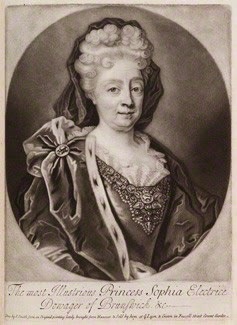 It was her Stuart connection that led ultimately to Sophia being named the heiress presumptive to the throne of England in the 1701 Act of Settlement--with William III dying and childless, and Anne Stuart's only surviving child, another William, having died at the age of eleven, in 1700, Sophia and the "heirs of her body" ("being Protestant") were determined to be the most acceptable successors to the English throne. Of course, if you do the math, it's easy to see that by time Sophia was named as heir to the English throne she was already seventy years old--she was mother to five surviving children and grandmother to three (legitimate) grandchildren, already teenagers. Sophia managed to live until the age of eight-three, dying on 8 June 1714--Queen Anne died two months later, in August. Although Sophia thus missed becoming queen of England, her eldest son, George, became king. While all of this is interesting enough, what is more intriguing about Sophia of the Palatinate is her link to the philosopher Gottfried Leibniz, librarian at the court of Hanover. Sophia corresponded with Leibniz for nearly forty years, from 1676 until her death. As Lloyd Strickland notes, "In philosophical circles, Sophie is known mainly as the friend, patron, and correspondent of Leibniz, who was employed by the court of Hanover. Although Leibniz and Sophie met often, both professionally and socially, they still corresponded regularly, and around 600 items of their correspondence survive today (this ﬁgure is inclusive of drafts and other variants)." But, more recently, Sophia of Hanover has been recognized as a philosopher in her own right. Rather than simply displaying a "passive interest" in philosophy, Strickland argues that "Sophie did make interesting philosophical contributions of her own, principally concerning the nature of mind and thought." You can access Lloyd Strickland's "The Philosophy of Sophie, Electress of Hanover," originally published in Hypatia: A Journal of Feminist Philosophy, by clicking here. You can also read for yourself--her correspondence with Leibniz, as well as that of her daughter, Sophia Charlotte, queen of Prussia, are published in Strickland's Leibniz and the Two Sophies: The Philosophical Correspondence. Of course you won't find a hint of this in the entry for "Sophia, Electress of Hanover" in the Encyclopedia Britannica. Just sayin' . . .
Also, there is the unpleasant matter of Sophia of Hanover's relationship to Sophia Dorothea of Celle, as we have seen . . .